Be careful what you wish for. Amidst the horse trading in the Senate over the Fair Work Bill one crucial fact has been lost. Despite their passionate commitment to rip up Work Choices, Kevin Rudd and Julia Gillard have done the very opposite. 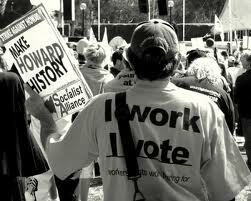 “The ALP were elected on the back of working people and the Your Rights at Work campaign. Now they are in Parliament, they have blatantly disregarded their promises to Aussie workers,” says the Bill’s greatest critic. This video begs the question of whether our leaders are capable of bargaining in good faith with either the Australian people or a handful of independent MPs. The Union Show is not currently screening at Channel 31 Melbourne and Geelong. The Union Show Blog provides ongoing coverage of union news, issues and current affairs. The Union Show has enjoyed the generous support of C31 for over five years and is currently nominated for an Antenna Community Television Award in the category of Information and Current Affairs. United hope to resume television production of The Union Show in the future - STAY TUNED! United Productions wish C31 the best in this exciting new year of digital TV.